Pay-TV service providers across the globe are responding to the emergence of agile video entertainment competitors. 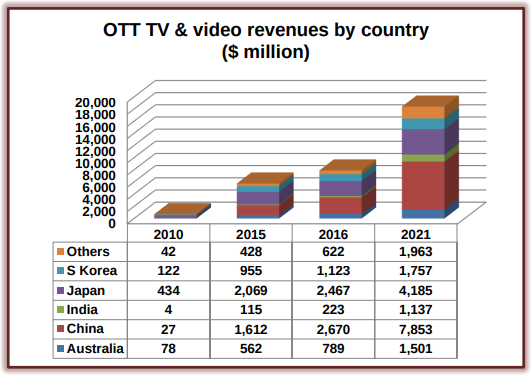 The over-the-top (OTT) television and video service revenues for 17 countries within the Asia-Pacific region will reach $18,396 million in 2021 -- that's up from $5,741 million in 2015. Furthermore, China will overtake Japan in 2016 to become market leader in the region. "Smartphone users will continue to drive OTT TV and video audiences. Smartphones are a more important OTT TV reception method than fixed broadband in the Asia-Pacific region -- with the notable exceptions of Australia and New Zealand," said Simon Murray, principal analyst at Digital TV Research. Advertising on OTT sites will remain the main revenue source, bringing in $8,745 million by 2021 -- that's up by $6 billion from $2,609 million on 2015. China will supply $4,911 million of the 2021 total, with Japan providing a further $1,475 million. Subscription video on demand (SVOD) revenues will increase from $1,816 million in 2015 to $6,439 million in 2021. China will add $1,838 million in revenues between 2015 and 2021. Download-to-own and electronic sell-through movie and TV revenues are forecast to be $1,904 million in 2021 (with $692 million from Japan), that's up from $691 million in 2015. OTT TV and video rental will climb to $1,307 million in 2021. Much of the OTT activity in 2015 and 2016 has involved local players establishing themselves in their domestic markets. However, according to the Digital TV Research assessment, a handful of companies are taking an international approach. Although there is substantial demand for foreign fare, local content is necessary in each market to entice new subscribers. Furthermore, international players benefit from partnerships with local players to gain from their distribution and retail infrastructure. International players must also adapt their prices to local conditions. With low levels of credit card ownership in most Asia-Pacific countries, local payment systems smooth the market development process. Launched in March 2015, Netflix has achieved considerable success in Australia and New Zealand -- markets most receptive to predominantly U.S. produced content. However, its January 2016 launches were conducted with little local content, little local price and payment sensitivity and without local partnerships. Mr. Murray believes that this may change, of course. For instance, Netflix signed a distribution agreement with Hong Kong’s 'Now TV' in March 2016 and has carriage deals with Singapore’s StarHub and SingTel. Netflix may have to adjust its policy rapidly to secure market share before its rivals become too entrenched. Major markets such as China, India, Japan and South Korea are already dominated by domestic players. South East Asia provides greater opportunities for international platforms.